Now with greater dual band compatibility our kit will work with ALL IR controlled devices! Want to place the cable box or other A/V devices out of sight yet be able to control them from in front of your TV? Our IR Repeater (aka remote control extender) kit allows you to do just that! How it works: The kit will relay the IR signal, through wires, from where you are using the remote control to the end device. The IR receiver of the kit (eye) is placed within sight of (within 25') of where you will use the remote control from. The emitter from the kit is placed over the IR receiver on the device being controlled & each receiver & emitter wire is plugged into the distribution block. Now, when pressing a button on the remote control, the signal will be amplified & sent through the system to your devices! 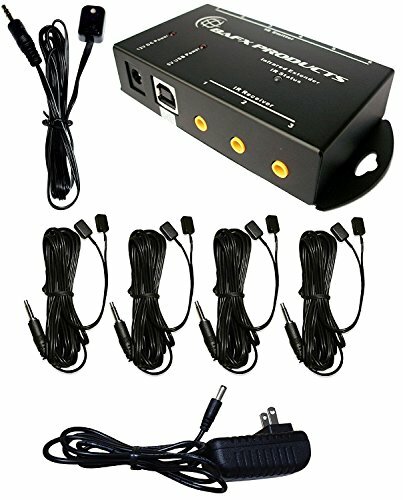 • Emitter cables are 8.5' long - emitting range 2-4"
BUILD - Create the A/V setup of your dreams with the help of our Infrared repeater kit. Our kit allows you to place any IR controlled device out of sight of the remote control and still be able to control it. Put the cable box, DVD player & Roku in a closet hidden from view, close the door and STILL be able to use the remote control. IMPROVED! Now compatible with ALL IR controlled devices with better performance, no lag & better ease of use. Now also compatible with Marantz devices! Compatible with all brands of components such as: Uverse, ATT, Cisco, Scientific Atlanta, Yamaha, Sony, Logitech, Verizon, LG, Apple & more! WARRANTY & SUPPORT - BAFX Products offers a 1 Year Warranty against manufacturing defects with a simple & super easy claims process. Not to mention our friendly and knowledgeable USA based support who are ready to help answer your questions and assist in getting you setup! COMPACT - A smaller footprint than many other kits on the market allows the main block to placed just about anywhere along with a new and smaller IR receiver for a more discreet look. With the addition of mounting tabs on either side it can even be affixed to a wall, cabinet or ceiling! CONTROL - With the provided components you can control up to 8 infrared devices (Expandable to 12 devices) from one location with the included IR Receiver (Expandable to 3 receivers). Extra Receivers and transmitters may be purchased separately. If you have any questions about this product by BAFX Products, contact us by completing and submitting the form below. If you are looking for a specif part number, please include it with your message.